Review – The Billionaire Escape Plan by Ember Casey – 5 Stars! Childhood friends Alex and Mae haven’t seen each other in four years; when they meet at a party they both realise things seem different, yet together they are as strong and as funny as ever. Were they always just friends or did their feelings run deeper without either truly realising? 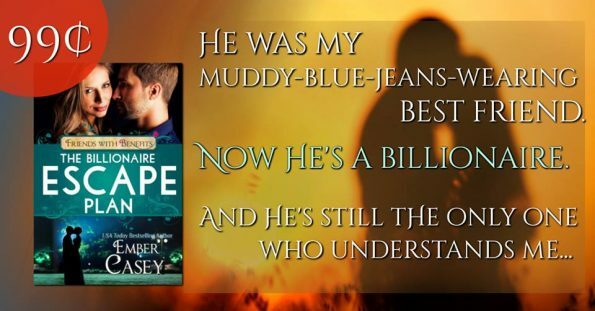 Ember Casey has written a billionaire romance with a twist and I absolutely loved it! This story is a sweet, humorous, contemporary romance that has you laughing out loud one minute and totally in love the next. Mae is witty and outspoken, never afraid to speak her mind and always manages to find herself in some kind of dilemma. I really liked her character, she wasn’t whiney or annoying, although she was a little blind to what was staring her in the face; for me this added to her character. Alex now a billionaire hadn’t truly lost his boyhood roots, he still deep down liked adventure. He was strong, loyal and caring, a true gentleman and it was clear he felt so much more for Mae than he had ever revealed to anyone. Although in their time apart they had changed, in many ways they hadn’t; it was clear how right and how perfect they were together and they simply brought out the best in each other. Mae grounded Alex and reminded him of the joys the world around him had to enjoy and Alex gave Mae the encouragement to explore her true self and the things she truly wanted out of life. If you love humorous contemporary romance this book is for you!